Last fall, Google bought Gizmo5 in order to create a desktop VoIP application to complement Google Voice, Google’s web-based phone forwarding service. The app hasn’t come out. However, some media reports say it’s unclear when and if the project will be completed. About a week ago, Google Voice users created an online petition, in which 3000+ people (with a goal of 500K) are demanding Google complete its planned desktop application. Why such strong demand? A couple of reasons. First, Google Voice users cannot currently receive calls on their desktop. Second, they can’t make phone calls directly from their desktop (without the use of an actual phone). Voxox gives out a free U.S. phone number upon sign-up in the U.S. (and dozens of other supported countries). This number rings the user's desktop application and it can also be forwarded to other numbers, but that's not necessary in this scenario. So, once someone adds the free Voxox phone number to the list of phone numbers they maintain in Google Voice, the user gains the ability to pick up a phone call on their desktop. They also gain the ability to make VoIP calls directly from their desktop without the use of an additional phone. 1. Sign up for Voxox and then download the desktop client. During the sign-up process, you’ll be asked to SMS-verify from your mobile phone to activate your free phone number. Make sure you complete this step to get your free number. 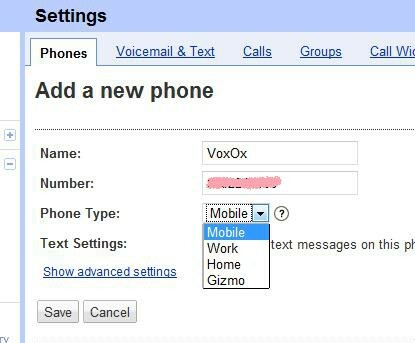 *For Google Voice to verify your Voxox phone, you'll need to temporarily disable all Voxox call screening options (there are 4). You can find these under Preferences -> Phone Settings -> General (top half of window). Enjoy Voxox as a seamless alternative for those who want a Google Voice desktop-like service right now… and give our other features a try too, like multi-protocol chat, social networking integration, fax, file sharing (up to 100 mb! ), our real-time translation tool "Universal Translator," and much more. Check out our video tutorial on our features here.